How to Eliminate Fabric Inspection from Garment Manufacturing Process? As a standard process, the medium and large-scale garment factories inspect the fabrics after receiving the fabric rolls from the fabric suppliers. The fabric checking process involves cost, manpower, machinery maintenance, and increases the process time. 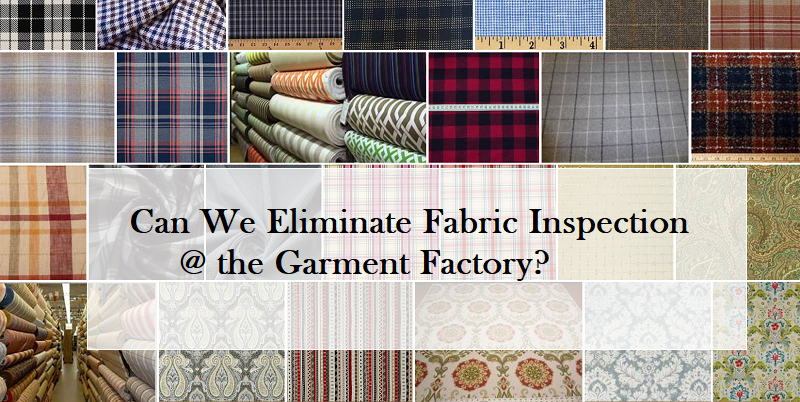 Now, the question is, can we eliminate the fabric inspection process in a garment factory? If yes, what will be the alternative way that would ensure having quality fabrics for cutting? In this post, I have shared the common steps that can be followed to reduce the fabric inspection and slowly eliminate the inspection of the fabric those are purchased form a pre-evaluated fabric vendor. Sharing one case. One start-up garment manufacturing company from Senegal was asking me to provide a trusted fabric supplier or a fabric trader contact. I asked her why she is mentioning the trusted supplier. Her simple reply was - first, they don’t have a system for fabric inspection at present as they are a newcomer. Secondly, if the fabric quality is not as per expected she neither can send the order back to India after getting the fabric imported nor can use it for making garments. It will cost a lot to return the fabric? She will not able to make the orders with the defective or inferior quality fabrics. The same thing applies to any Indian garment manufacturers. Though most of the Indian garment companies purchase fabric from locally, sending back the fabric to the fabric suppliers is rarely done. Instead, one tries to compensate the bill by sending the supplier a debit notes against the defective fabric volume. That does not solve the issue, you need to place the order again for the shortage quantity. The fact behind fabric inspection? Fabric inspection is done prior to the bulk cutting process. There are some standard processes of checking the fabrics and report making after fabric inspection. Some factories just check fabrics and mark defect areas without measuring and counting defects. They don’t make any kind of report and don’t do any fabric quality assessment of the inspected fabrics. If we look back at the fabric suppliers, they also inspect the fabric before packing and delivering to the garment factories. Some of them make a true report and some of them may not be making any inspection report. If you know that fabric supplier has already inspected the fabric and given to you the inspection report following the standard inspection procedure (4 Point system or 10 Point system for fabric inspection). Why you need to perform the inspection of the same fabric in your factory? The fact is all the fabric lot cannot be made in the same shade. If there are few weaving defects or knitting defects in a fabric rolls, the whole fabric cannot be rejected by the supplier. All we understand that defect located/appeared in some portion of the fabric can be managed during fabric cutting. This is the primary reason for fabric inspection. If there are defects across the fabric width, split the fabric and remove the defect portion from the layering on the cutting table. Small factories or the start-up companies don't follow the fabric inspection process. That might be due to unawareness of doing fabric checking or might be they don't know what to check in a fabric and how to check it. Even employing a fabric checker will increase their overhead cost. Additionally, they don’t work for bigger volumes for which they can engage checkers for full-time. If the fabric checking is done by the garment factories, fabric suppliers will be under pressure that their fabrics will further be inspected at the factory level, and their faulty fabrics will be caught later. So, they will think before supplying faulty fabrics. The checking process helps a garment factory getting quality fabrics from the supplier. Why a garment factory inspects the fabric? You need to know and you need to do self- analysis about the need for fabric inspection. Ask below questions and answer it. Is it to get a satisfaction that you are following a good process and by following fabric inspection process, it can be ensured that garment quality will be improved? Is it for grading of fabrics? Is it for preparing an inspection report and marking defective areas on the fabric, o that while the fabric is layered on the table defective fabric portion can be avoided including in a garment pattern? Is it the factory’s standard process to follow the fabric inspection process whatever the fabric it is or whoever the fabric supplier is? If you think only by adding fabric inspection in the process will improve the fabric quality? You don't. Through the inspection process, you can segregate the fabrics and you can do fabric grading. In the apparel manufacturing business, we think it is a very complex supply chain. It is really one. The fabric is a soft goods material, and flexible. Handling the fabric is difficult compared to other hard goods products. In the total garment manufacturing cost, the fabric is the most costly and primary material for garments. As a buyer of fabrics, most of the garment makers don't rely on the fabric suppliers. They want to be more assure that whatever fabric is received are good enough for cutting without much fabric wastage is cutting stage and no defective fabric panel should go to the sewing line. Ask your suppliers to inspect the fabric at their end and send their fabric inspection report with the order. Ask them to mark or paste defect marking sticker on the defects area. After receiving the fabric inspect the same fabric at your factory using standard fabric inspection method. Prepare report and compare the inspection results. If you see, supplier inspection result is matching with yours, you can consider the supplier as a trusted one. When one thinking of eliminating the fabric inspection at a garment factory or at a garment manufacturing level, you need to evaluate the fabric supplier based on their fabric quality. The vendor evaluation can be done by inspecting a certain percentage of fabrics, for the initial orders. If you see, you are constantly getting quality fabrics from a supplier, you can reduce the inspection process for that fabric supplier. Fabric quality means many other things rather than only the visual defects (cut, hole, shade variation,). Other things can be verified through the testing process whether an in-house or getting fabric sample tested from a testing lab. I would say, yes you can eliminate the fabric inspection process but that can be followed for only selective fabrics and selective suppliers. Instead of completely stopping the fabric inspection, 10% fabric inspection out of total rolls. That 10% fabric inspection data will give you enough data to assess the rest of the fabrics. Go for buyer approved fabric suppliers. For a new supplier, measure their fabric quality for the first few orders. This way you can reduce the rate of fabric inspection. Online Clothing Study: How to Eliminate Fabric Inspection from Garment Manufacturing Process? Why garment factories should eliminate fabric inspection? How to identify the trusted fabric suppliers who provide quality fabrics.